He had lied by six years, which is not a small number, presumably to get dates with women in their early 30s, as I was. Perhaps he hadn’t been caught before, or perhaps no one was as up front about her distaste for liars as I was, but he sat there with his tail between his legs while I kindly but firmly told him that he was wasting my time. Earlier this year, the New York Times featured a story about a lovely-looking couple in the wedding section titled “Stretching the Truth to Find Love Online.” The article commented on how the groom, 5’5, had fudged his height to 5’8 to get more profile views. While I can’t agree with it, I, of course, am not blind to his rationale. Women often make an arbitrary cut-off of anything below 5’8… or 5’10… or 6’2. For men’s sake, I wish that being tall wasn’t equated with being attractive for so many. Would I be tempted to lie if I there were something about me that I knew many men weren’t inclined to go for? I’d be, well, lying if I said no. But, that doesn’t make it right. I’m thrilled that things worked out for this couple. 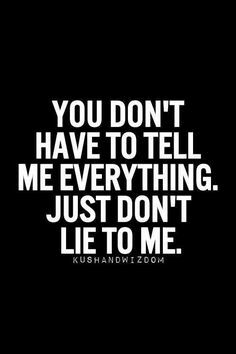 In the end, though, lying, especially about something that will become apparent the minute someone meets you, generally only bites you in the behind. While you and your date may get along, you got the date under false pretenses, and he or she may be wondering what else you lied about. And we know most people are us online stalking us anyway, so it’s best to stick to the truth, the whole truth, and nothing but the truth.